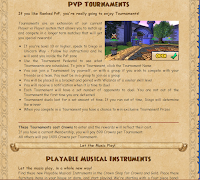 Wizard101 just announced the news that the Wizard101 Test Realm is online with new musical instruments that you can play and can be bought for crowns and gold. PvP tournaments are a new extension for PvP that allows you to match up and compete in longer term matches that get you special rewards. This will cost 899 crowns for members and 1499 crowns for crowns players per tournament. Click on the image to the right for more information on the test realm. You'll need a membership or have made a purchase in the last 30 days. See ya'll in the test realm! Edward & Autumn get their level 88 spells! Edward Cringle starts questing through Valencia! Edward continues to side quest through Monquista! Edward Cringle starts Side Questing! Pirates De Mayo Contest Winners! Cinco De Mayo Farming Event! Idea Post: Level 100 Gear!